So as you may know, I’m an MMORPG guy – not really a battle royale guy. There are some cool ideas for people who like the combat of survival games turned up to 11, but that’s not my thing. I like community building, crafting, negotiating, and generally using my words to avoid direct combat. So when Automaton games announced Mavericks and said it’d be adding MMO elements to the battle royale genre, I got a bit excited. However, after having some hands-on time with the game and talking to Automaton Games’ CEO James Thompson at this year’s GDC, I’ve come to the realization that it’s much more for the battle royale crowd than the MMO crowd, and this will be especially true at launch. For those who don’t know, Thompson is also a co-founder and researcher at Playfusion, a kind of AR toy/card game company that makes things that seem cool to me. However, none of his work there is currently intersecting with Mavericks beyond any inspiration that might come from talking to fellow creatives. Has lots of experience himself, including at Jagex, but he’s with a new team. His recent work on Deceit helped his team see how well they could make deadlines, plus, the game was profitable, so they’ve put in some paces to work with SpatialOS to build a new project. Before my interview, I got some time with Mavericks, and to be blunt, the game is basically a battle royale for people who like hunting people. Granted, I think it was a good demo, in that it did all the things I expected of the genre and that I’d heard were features of the game. The round was quite quick, our demo guy was merciless, but even though I was alive and exploring for a bit (third to last to die! ), I was able to see footprints and a little bit of environmental interaction via hiding in bushes and exploding barrels. Thompson doesn’t like to limit the idea of Mavericks to the genre as it is, but as much as I tried to find something that really makes it stand out, the only thing that Mavericks seems to do differently at the moment is to be a more real-world environment based human hunter on a larger scale, more akin to the battle royale movies than simple games. When I think of MMOs, the “RPG” part is always silently there in my mind. It’s what defines our genre. While you can tack anything else on, I feel that RP should be an option. People should stand around social hubs, trade items, craft, role play, do things that enhance their game experience without directly killing. Killing is a core feature, but I know games like Ultima Online, Asheron’s Call, and Star Wars Galaxies – games that helped define our genre – all had systems that allowed you to level up without leaving town if you wanted to. Yes, you might need someone to feed you materials, but it was still possible. Don’t expect that in Mavericks. Don’t expect big PvE play. Don’t expect any “bolted on” mechanics like Fortnite’s building system has become. 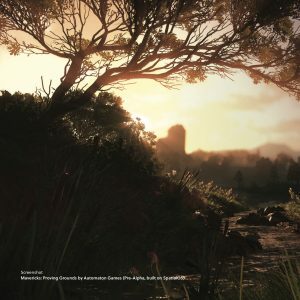 There will be a social hub at launch for socializing and trading, but I was told that most systems will be realistic mechanics that would connect with the game world, if that world were a battle royale. What stood out to me was the idea of good gun play, attention to sound, and muddy footprints for tracking people. This is basically what I saw from the very short demo I played, so if battle royales aren’t for you, don’t expect Mavericks to change that. There will eventually be a “global narrative,” but Thompson didn’t want to go into it yet. That being said, there will be a persistent RPG side later. Again, Thompson didn’t want to say much, but think of PUBG combined with PlanetSide 2: factions, persistent characters, territory that’s held after a win state, but bigger, more detailed maps. That can appeal to me a bit, as I enjoyed my time in PS2, though I was mostly an engineer and/or truck driver so the players with good aim could go out and do their work while I kept them as safe as possible (on the ground in a non-moving vehicle because crashing is my specialty in that game). Even the competitive side will be similar to PS2 in that it may be an MMO, but the competitive mode won’t be using your MMO character. That being said, Thompson feels battle royale gameplay is more intuitive than MOBAs, and while from a non-player POV I’d firmly disagree, I do feel that among certain crowds, gamers are more often exposed to FPSs than MOBAs, so it’s a fair point. Mavericks is supposed to be different in other ways too. The zone shrinking area battle royales have won’t really appear in the MMO side of the game, but it will in the competitive/e-sports end. If the punishment for being outside the zone is a kind of stick, than Thompson says the devs will be creating “carrots” to encourage you to play in a kind of intermediate zone between the traditional safe zone and shrink zone. Again, Thompson doesn’t want to share much about the shrinking map mechanic but says to expect something different from the genre norms. The team wants to move people together, but give you some leeway. I suggested swarms of bears, giving people the option to run away or try to live among the bears. Big cuddly, slightly dopey looking animals that kinda maul people given the chance. They could be both the carrot and the stick. Sadly, bears were not confirmed, but the general idea was on track. The PR person liked my bear idea, though, so I’m hoping she’ll talk Thompson into it before I hopefully see them again at E3 2018 to scope out just how far the game has come.